Dan Smith is a wiz when it comes to math. The Kensington Woods High School senior - who can solve a Rubik's Cube in less than 30 seconds - recently finished in the top 5 percent on the Mathematical Association of America's American Mathematical Contest 12. His score qualified him to take a higher-level exam, the American Invitational Mathematics Examination, in March. "The second test was longer and very different from the first, but I think I did well," Smith said. Both tests are administered by the Mathematical Association of America and taken by gifted students across the country. The organization offers several levels of testing, with the exam Smith took most recently one of its toughest. The three-hour exam consists of 15 questions in which each answer is an integer number from 0 to 999. The test is designed so that it is very unlikely to obtain the correct answer by guessing. Students cannot use calculators on the exam, which also does not include multiple-choice answers. "The questions are extremely challenging," said Shawn Pollman, a math teacher at Kensington Woods. "In fact, it might be very difficult for the average person to even understand what the questions are asking." Pollman, who teaches algebra, trigonometry and calculus at the Genoa Township high school, has had Smith in her classes for four years. "He's like the ideal math student," Pollman said. "He has a natural talent in math, he's self-motivated and he's a team player. He goes far beyond what ... is expected." Although Smith clearly has a talent for numbers, he said math isn't at the top of his list of interests. "I wouldn't say I have a major interest in math, but I like to compete at things I'm good at," he said. That competition category would also include video games, which Smith plans to make a career out of. He plans to attend Lawrence Technological University this fall to major in computer science with a concentration in game design. He earned a $72,000 scholarship to attend the school for four years. Smith's mother, Lynn Smith, said her son has worked hard for his achievements, which also include participating in a German exchange. The teen, who has taken three years' worth of courses in the language, spent time in Germany last school year through a program organized by his high school. 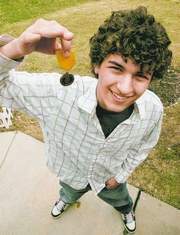 The math wiz also qualified to participate in a World Cube Association competition in San Francisco at age 15, when he solved a Rubik's Cube in as little as 23 seconds. "We're proud of him," Lynn Smith said. "He's worked hard for what he's getting."